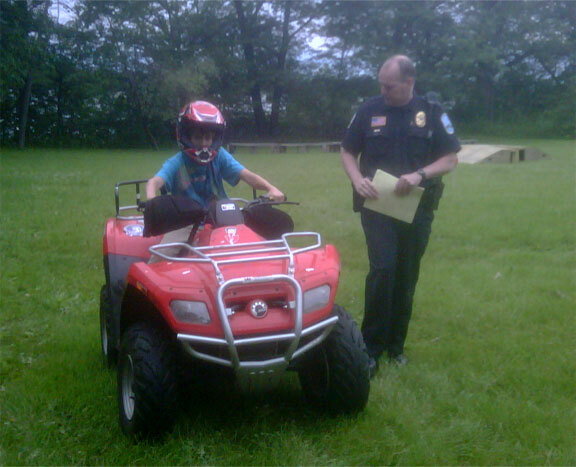 The Lakes Area Police Department conducted an ATV safety Certification in conjunction with Chisago Lakes Middle School Mini Courses on the last three days of school. The driving test was held on June 10th (thursday) at Camp Ojiketa in Chisago City. Pictured here is a participant in the class and Deputy Chief Bill Schlumbohm. A special thanks to Doris Zacho and Chisago City Parks Department for allowing the use of Camp Ojiketa. 28 students received their ATV Safety Certification.